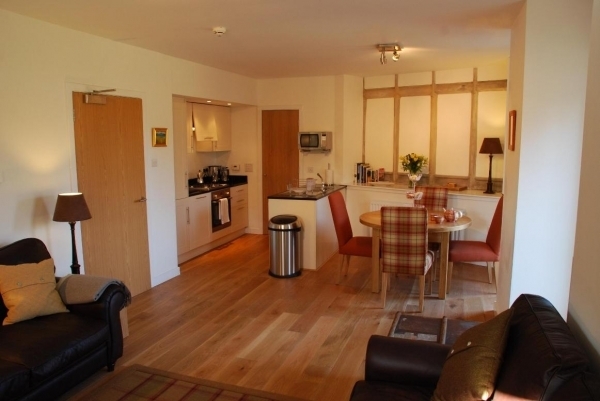 Luxury 2 bedroom cottage with uninterrupted views of Loch Ness. Situated in a converted Benedictine Monastery set in 20 acres of private grounds on the shores of Loch Ness. In the heart of the Highlands, this sympathetic conversion is an ideal base for exploring all that Scotland has to offer. Whether you are searching for outdoor adventure, or simply just want to unwind, this is the place to do it. From white-water rafting to whisky trails and ceilidh evenings, you'll quickly find that a week is just not long enough! Abbey Church 3 has lovely views over Loch Ness. Tastefully decorated with beautiful furnishings this property is both comfortable and spacious. The lounge has french doors which open out on to a pretty private terrace with stylish seating and BBQ. The south/east facing terrace offers a bright area to enjoy the light summer evenings and wonderful views over Loch Ness and the Monastery lawns. As this property is located on the ground floor with direct access to the Monastery lawns it is also a suitable option for guests with low mobility. There are two bright and spacious bedrooms and two bathrooms with a walk in shower and bath. Abbey Church 3 is conveniently located with easy access of The Chapel Pool with sauna and steam room. <font color=purple>For group reservations it is in close proximity to St Andrews Chapel/Abbey Garden/Abbey Church 12/Abbey Church 9.</font>As a guest you will have access to all The Highland Club has to offer. Our property manager will meet you on arrival and show you to your accommodation. Facilities included are The BOATHOUSE RESTAURANT providing an idyllic setting on the shores of Loch Ness in which you can enjoy delicious, locally sourced food. The HIGHLAND CLUB SWIMMING POOL, SAUNA & STEAM ROOM. Within the stunning grounds OUTDOOR PICNIC TABLES AND BBQ'S are provided for guest use; TENNIS COURT, outdoor TABLE TENNIS, CROQUET LAWN, GIANT CHESS and CHILDRENS ADVENTURE PLAY AREA promise to keep everyone amused. The Monks refectory has been transformed into THE HIGHLAND CLUB LOUNGE with its oak panelled walls and stained glass windows, providing a sumptuous area to relax with friends or enjoy a game of SNOOKER (WIFI access available).